This reflected the history of the Kerika product: we first designed and built the card actions, and much later added the column actions. 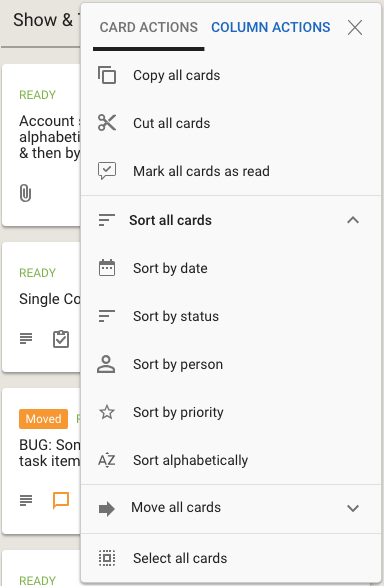 We have also done some small tweaks to the sorting action: Sort by Status now puts the On Hold cards at the bottom of the column, below all the ones flagged as Normal. 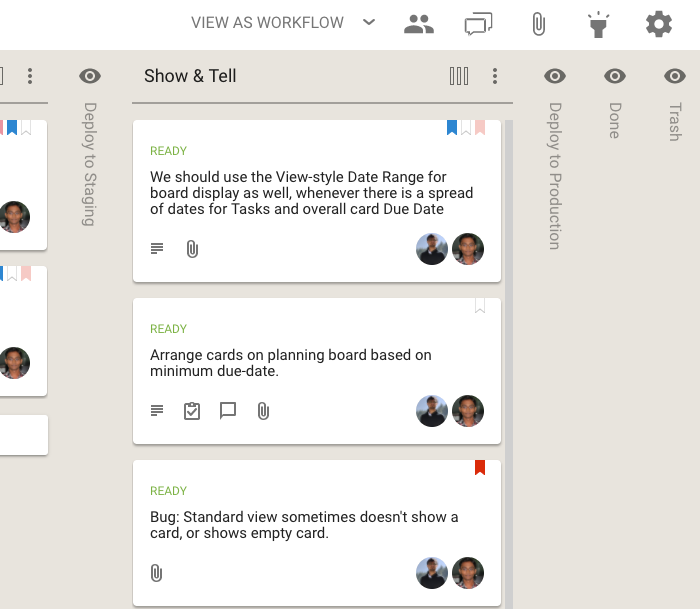 In the example shown above, the Release Notes column is empty, so it is shown in a light shade of grey, while the Final Review column has at least one card, and it is shown in black. 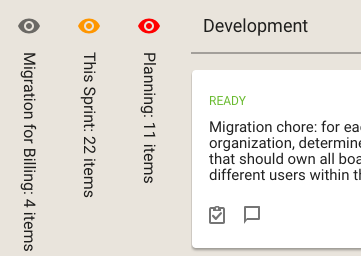 The orange icon in the example above shows that the This Sprint column contains cards with updates on them that you haven’t caught up on yet, and the red icon shows that the Planning column contains overdue cards. For users of Kerika’s Task Boards and Scrum Boards, we have made it easier to prioritize your work. 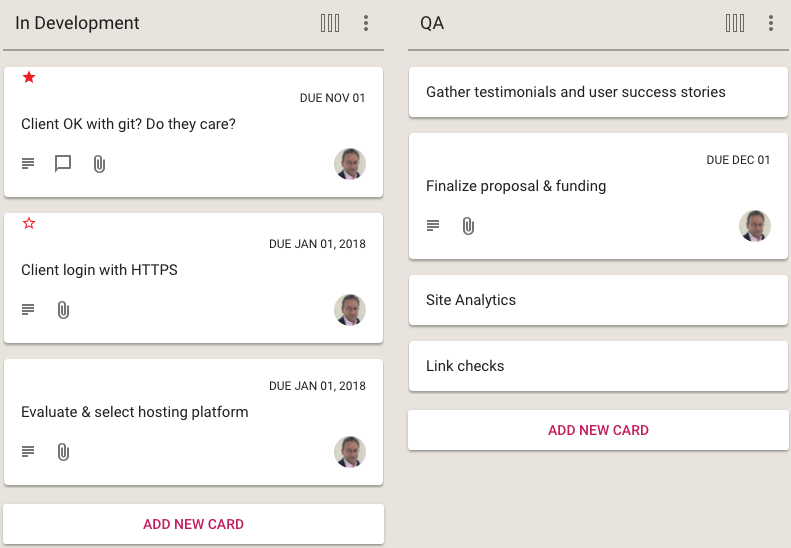 Traditionally, in a Kanban or Scrum board the priority is denoted by the position of the card within a column: cards that are higher priority are placed higher within a column, and the card at the top of the column is the highest priority at that stage of the workflow. 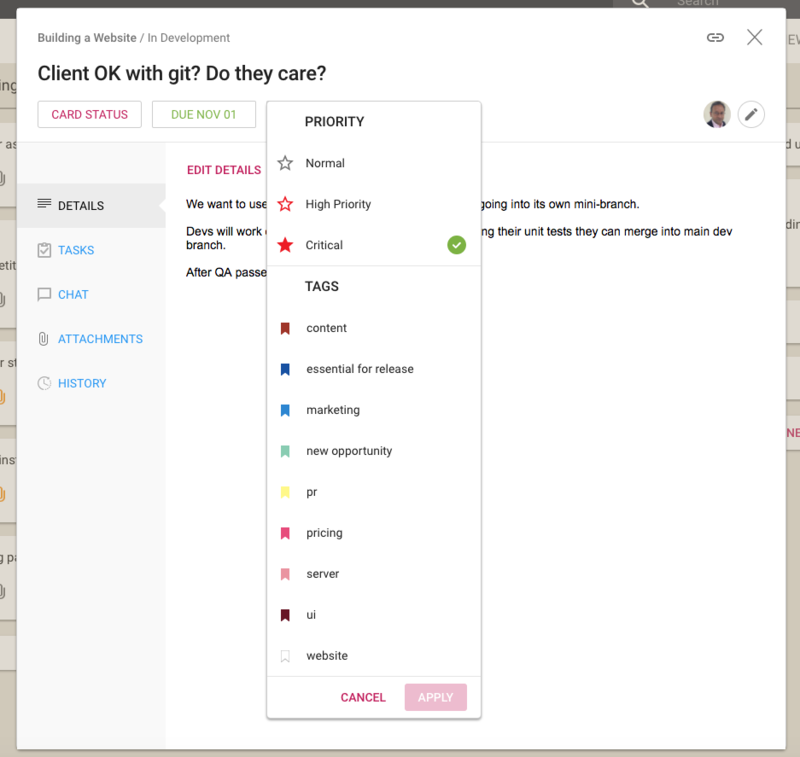 This method has the advantage of simplicity and clarity: there is no ambiguity about what is the most important work item at any stage of the workflow. The disadvantage of this method is that as many cards start to move across the board, especially on boards where the workflow is complex (i.e. the board has many columns), it becomes harder to track all the cards that are especially important. 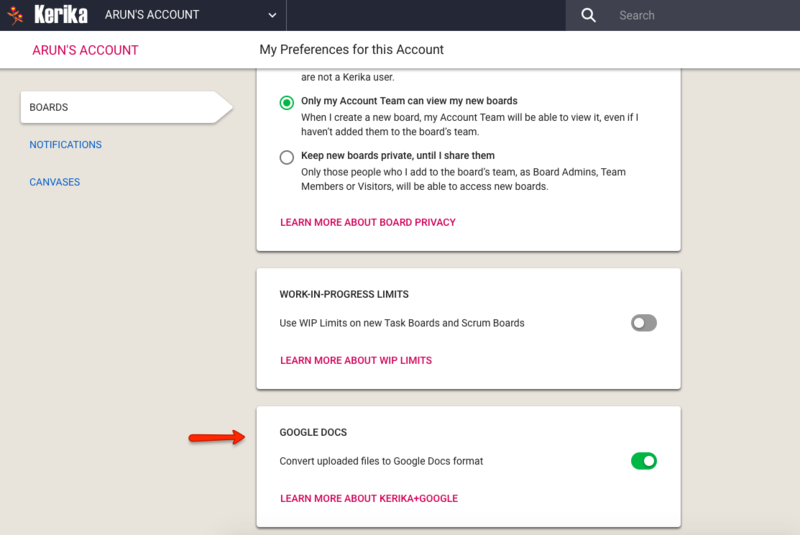 In other words: the simple method doesn’t scale well, and our goal with Kerika is to provide the simplest user interface on top of the most capable work management system, so we realized we needed to do something more. 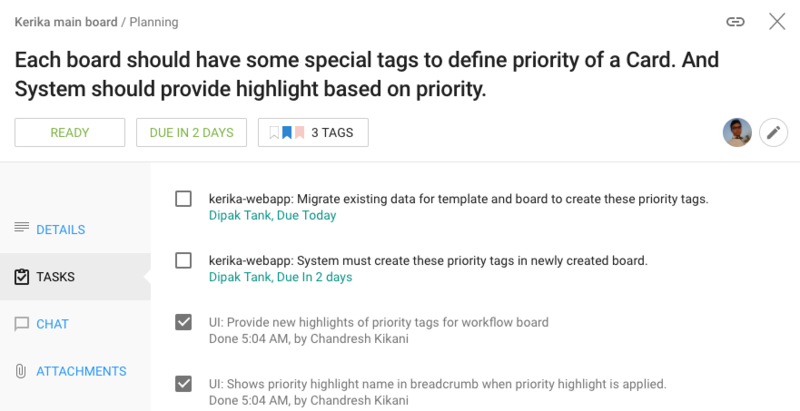 Along with assigning tags to a card, you can now set the priority of the card as well: by default all cards are Normal, but they can alternatively be flagged as High Priority or Critical. 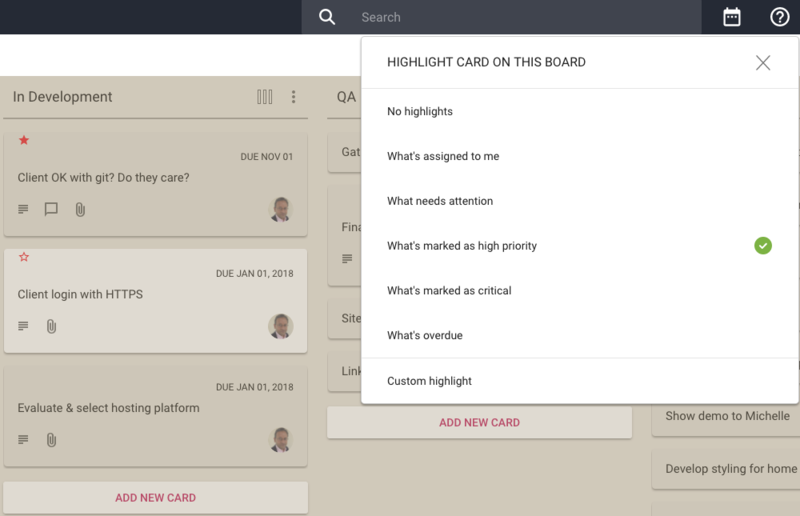 The Normal Priority cards don’t have any star; we didn’t want to crowd the design which would have made it harder to spot the more important High Priority and Critical cards at a glance. 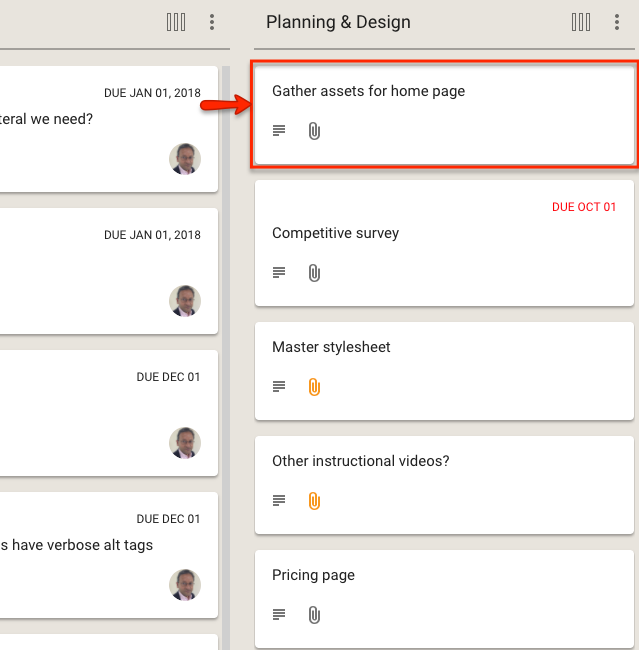 We have made it easier for teams to manage multiple Due Dates within the same project, especially when a single work item (as represented by a Task Board or Scrum Board card) contains many different sub-tasks, each of which could have a different Due Date. 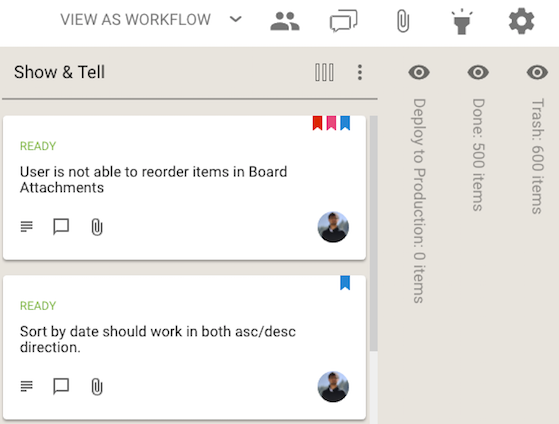 Where a card has multiple tasks, each with different Due Dates, the range of dates is shown on cards to make it easier to understand the “time footprint” of the work item as a whole. 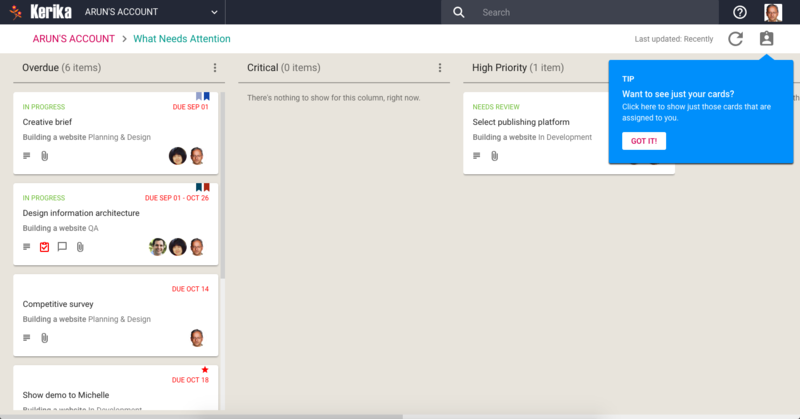 This provides better context, better usability for users who work with due dates: at a glance you can see the overall “time footprint” of a work item that involves several sub-tasks. 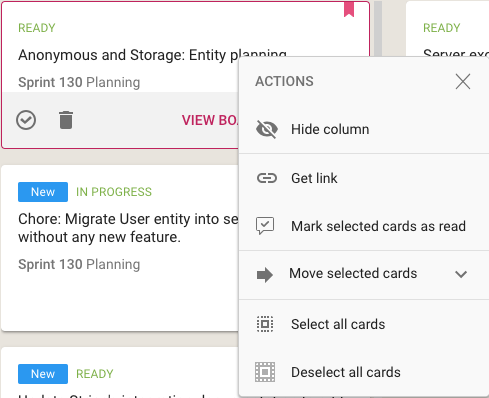 The What’s Assigned to Me and What’s Due Views are now smarter about handling multiple due dates for the same card: if just one task within a card is overdue, even though the card as a whole isn’t yet overdue, this is shown in the Overdue column in these Views. 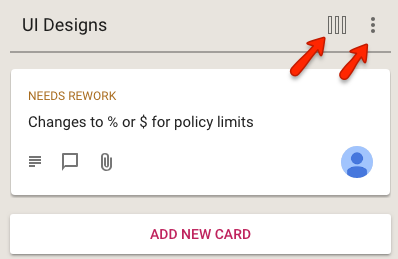 Your 6AM summary email (which you can turn on optionally) now lists the due dates on individual tasks within cards, as these become overdue or due this week or next week. 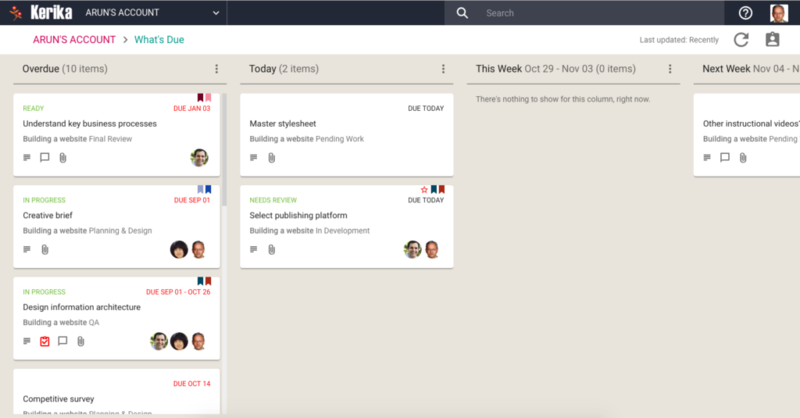 We have made a tweak to the Hide Column feature that’s available on every Task Board and Scrum Board, for all Board Admins, Team Members and Visitors. The name of the column that was being hidden was shown vertically, to make it easier to retain the overall context of the board. 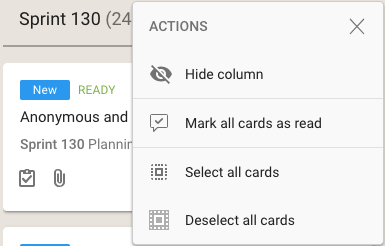 The subtle (but important) distinction is that Kerika now shows you how many cards are in the hidden columns, not just the name of the column. 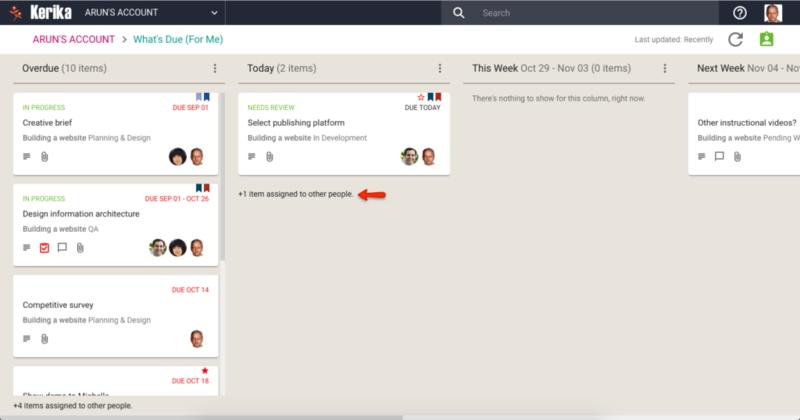 We think this will make this feature more useful, to more people, more of the time.